House Speaker Paul Ryan of Wis., joined by House Republicans, speaks to the media following a vote on tax reform, on Capitol Hill in Washington. A popular deduction targeted in the GOP’s overhaul of the tax code is used by more than a quarter of all filers in a majority of states, including many led by Republicans where some residents eventually could see their federal tax bills rise. 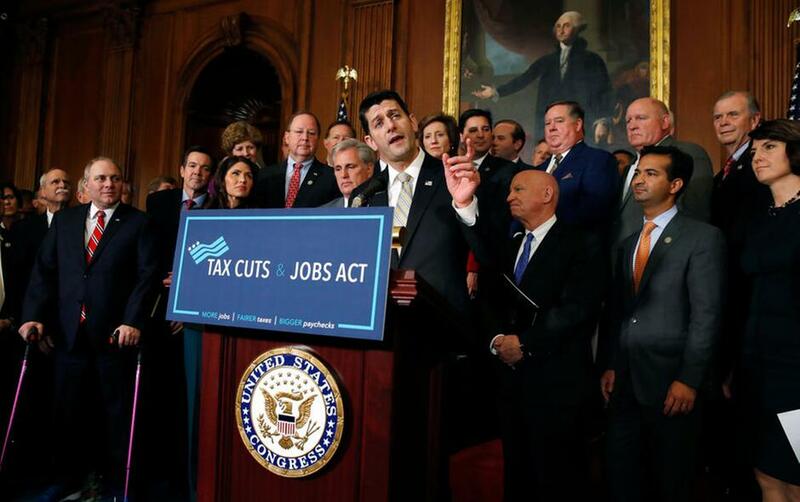 ATLANTA, GEORGIA (AP) — A popular deduction targeted in the GOP's overhaul of the tax code is used by more than a quarter of all filers in a majority of states, including many led by Republicans where some residents eventually could see their federal tax bills rise. The exact effect in every state isn't known, in part because of differences in the Senate and House versions of the bill. But the change to the deduction for state and local taxes could alter the bottom lines for millions of taxpayers who itemize. "It's a bad deal for middle class families and for most Georgians," said Georgia state Rep. Bob Trammell, leader of the House Democrats. He said Republicans are eliminating the state and local deduction to help pay for tax cuts for businesses and the wealthy. Republicans say that provision would be a net benefit for most tax filers. The Tax Policy Center, run by the Urban Institute and Brookings Institution, has estimated that the number of people itemizing deductions would drop by three-quarters. Some of those taxpayers could get a larger deduction under the Republican plan, even though they no longer could claim a break for state and local taxes. "Based on what I have seen, it might actually help some Georgians" to replace the state-and-local tax break with a higher standard deduction, said Georgia state Rep. Terry England, the Republican chairman of the House Appropriations Committee. Yet estimates by the Tax Policy Center and a nonpartisan congressional analysis say some taxpayers eventually will end up owing more in federal taxes under the GOP plans. The left-leaning Institute on Taxation and Economic Policy said changes to the state and local tax deduction under the House bill would contribute to one of every five taxpayers in the hardest hit states getting a higher tax bill. While most of those states are led by Democrats, Republican-led Georgia and Utah, and the swing state of Virginia were among them. The top 10 states with the highest average state and local tax deductions all voted for Democrat Hillary Clinton in last year's election. New York led the way with an average state and local tax deduction of more than $22,000, followed by Connecticut, California, New Jersey and Massachusetts. Because of its widespread effect, debate over curtailing the deduction already is creeping into competitive 2018 elections. Democratic U.S. Sen. Tammy Baldwin of Wisconsin has warned that repealing the deduction could lead to a tax increase for many state residents. "That's not right and it's not fair," she said during a news conference Friday in Milwaukee. One of her Republican challengers, state Sen. Leah Vukmir, has signed a letter encouraging the tax repeal. Republican Gov. Scott Walker, a tax overhaul supporter who is seeking re-election, has been criticized by the liberal advocacy group One Wisconsin Now. The group says repealing the deduction would have "the net effect of a massive property tax increase for Wisconsin homeowners." Utah state Sen. Howard Stephenson is a strong supporter of repealing the state and local tax deduction, even though a comparatively high percentage of residents there claim it. Stephenson, a Republican who is president of the Utah Taxpayers Association, said he believes the deduction generally favors high-tax states to the detriment of states with a lower tax burden, such as his own. "We don't like paying for the excesses in other states," he said.